Leprosy has been present since earliest times. 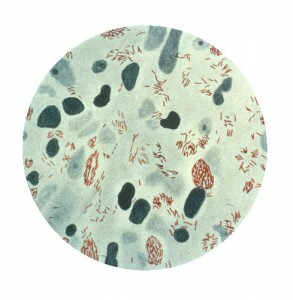 The genome of M. leprae, the mycobacterium that causes leprosy, is ancient. It probably originated in eastern Africa more than 100,000 years ago. When the genome was mapped in 1993, scientists discovered that it had shed all but the bare necessities for its metabolism, and it continued to survive by being very economical. *1 It does not infect many people and it does not kill its host, yet it continues to infect sufficient numbers in order to ensure its transmission. The disease appears to have spread with the flows of migration out of Africa into India, between Africa and the Middle East and Europe, and from Europe into the Americas. (Schuenemann et al.) In the Medieval period, there were lazar houses throughout Europe and the disease was certainly endemic. (Rawcliffe) We know that what we now call leprosy went by many different names throughout the world. (Hebra and Kaposi) We also know that the disease manifested itself in a variety of ways depending upon the body’s immune response. Only since the mid-nineteenth century has the disease entity “leprosy” been universally recognised. Well into the nineteenth century, there were still people being infected with M. leprae in Norway, Italy, Portugal, and Spain. By then, people were also returning to Europe from the colonies with leprosy. Up until 1948, there was really nothing that could be done for people who contracted the disease. In general, the range of symptoms were extensive. At its worst, it had a terrible effect on the body – changing how people looked, robbing them of their defining features. Because of the nerve damage caused by the infection, people could very easily injure their hands and feet, and this resulted in visible mutilations. People not only suffered from leprosy, but in many societies, they also suffered because of the disease. They were often expelled from their families, excluded from their villages, and deprived of their possessions and their legal rights. Sometimes when a person was diagnosed with the disease, the full weight of its historical representation of would come down upon them, and they would exclude themselves out of a sense of shame. (Stein) In other instances, while people could still contribute to the economic well-being of their family, they would remain with them, but once they became a burden, they would remove themselves to the nearest asylum. In many countries, laws were enacted that would require people to be removed to an asylum and be isolated there for the rest of their lives. In this way, from the mid-nineteenth century, countless people were forcibly detained and imprisoned in places of isolation. They lost their legal status, and they were not permitted to marry. Healthy children born to them were placed in orphanages. In some countries, if people wanted a partner, they had to undergo sterilisation before they were permitted to marry. Although all of this sounds like something that happened in the dim dark distant past, there are still many people alive today who can tell of their experiences in leprosaria or who are seeking their biological parents. And yet, in spite of the great injustices done to people with leprosy, they have been extraordinarily proactive in refusing to be reduced to their illness. They have fought against being labelled in demeaning and dehumanising ways. They are now asking for their basic human rights to be restored to them. Effective medication against the disease became available in 1948, and by 1981 combined chemotherapy made it possible to treat leprosy and halt its destructive effects. Physicians emphasise the importance of early diagnosis and treatment so that the irreversible and destructive effects of the disease can be halted as early as possible. 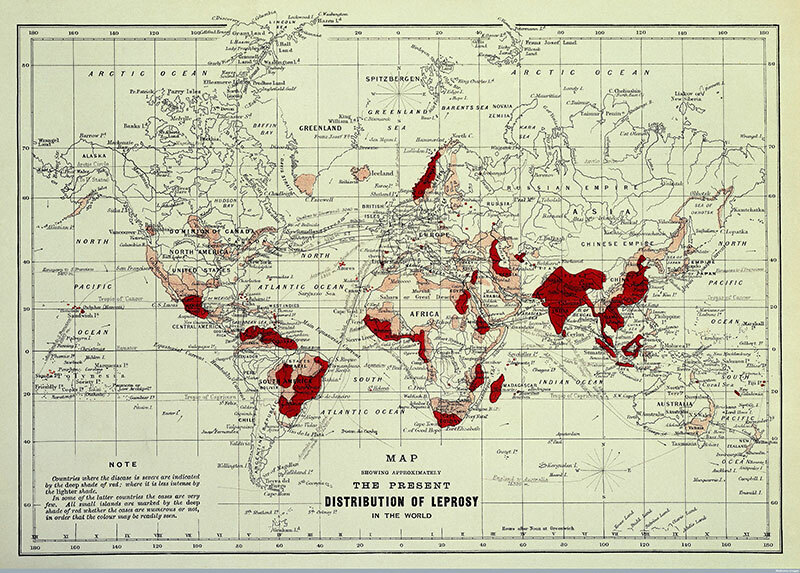 Map showing the distribution of leprosy around the world in 1891. *1 The analysis of the first complete M. leprae cosmid sequence was conducted in 1993. The genome sequencing project was coordinated by Stewart Cole and Bart Barrell and supported by the Association Française Raoul Follereau, ILEP, the Heiser Program for Research in Leprosy and Tuberculosis of The New York Community Trust, the World Health Organisation and the Institut Pasteur. Additional funding was provided by the Wellcome Trust; M. Monot, et al., “On the Origin of Leprosy”, Science 308 (2005): 1040-1042. V. Schuenemann et al., “Genome-Wide Comparison of Medieval and Modern Mycobacterium Leprae”, Science 341(2013): 179-183. C. Rawcliffe, Leprosy in Medieval England, (London, Boydell and Brewer, 2006): 158-168. Ferdinand Hebra and Moriz Kaposi, On the Diseases of the Skin Including the Exanthemata, ed. and trans. Waren Tay (London: The New Sydenham Society, 1875). Some of the various names given to what we now recognize as leprosy were: “Lepra Arabum, Elephantiasis Graecorum, Leprosy of the English, Spedalskhed of the Norwegians; Aussatz, Maltzey (of the Middle Ages), Limafalsk (Iceland), Malum mortuum, Malmorte (Salernitan school), Mal rouge (de Cayenne), Mal rosso, juzam (Arab.) Krimskaia, Lepra taurica, Rosa asturiensis, Kushta (India), Fa-fung (China), Koban (Africa), Kokobay (West Indies), Ngerengere and Tuwhenna (New Zealand) Morbus Phoenicius, Morbus herculeus, Satyriasis, Leontiasis (of the old Greeks), Zaraath (Hebrew), Morphoea, Spiloplaxia, Tyria …” (118). Stanley Stein, Alone No Longer, (Carville, La, 1963): 23-24.